Zak is 4 years old and needs a new home as his Dad is working long hours and is unable to care for him properly. Zak is currently living in Merseyside, and spends his day-time hours with a foster carer. Zak is a wonderful companion, but has spent a long time alone due to family changes and his Dad's long work hours. Therefore it takes a while for Zak to learn to be part of a family again. He is used to spending all of his time in the kitchen, although he is slowly learning that he is welcome in other areas of the home and will now seek company with his foster carer. 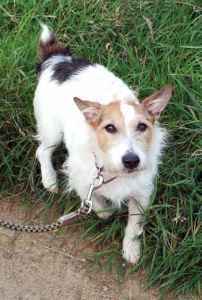 Zak is a wiry coated Jack Russell with short legs, and like most Jack Russell's is not good with small furries. However he is generally good with other dogs, and has been raised with chldren, so careful introductions will bring rewards. Zak is fully house-trained, and despite a little exuberance when he first sees his lead he walks well and enjoys his walks. Having been confined to a kitchen for the majority of his life and not well socialised Zak finds the front door a fascination, and will bark madly, shredding the post as it arrives and becoming anxious about visitors. However, his foster carer has been working with this and if Zak is asked to go to his bed before opening the front door the problems are easily overcome. Advice about managing this ongoing training will be provided to Zak's new home. In all other respects Zak is a well-behaved, loving and cheerful little dog who really wants to be your best friend. He has fantastic recall offlead, learns very quickly, loves to play and will make a wonderful companion. Anyone interested in rehoming Zak needs to Contact us or telephone Clare on 07929 478634 for an informal chat.